Well, it took a once in a life time experience witnessing nature in it's rawest form to get me to start a photo blog... So, here it goes. Remember to click on photos for larger (and somewhat clearer) versions. I took my three youngest boys up to Yellowstone last week. We were headed to take some pictures of the falls we call "funky rock falls" and we saw some cars stopped watching an Elk standing on a small island at Nymph Lake. We stopped and asked what was up and they said some wolves had pestered the elk and people were curious if anything would evolve. I did a u-turn (got in trouble with a warden) and we got positioned for the evening. 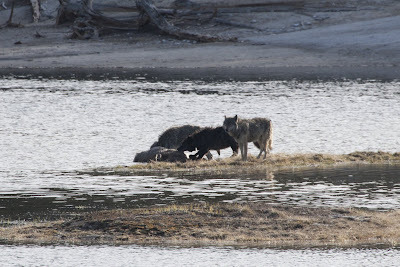 Some people left after 30 minutes because the 3 wolves (Canyon pack (the warden said), 2 greys (one collared) and a black one (collared)), wandered off to the South. They laid down and didn't seem very interested. I kind of had a roman Colosseum moment. More people had gathered and we were watching the Christians waiting for the lions to be released. Well about 20 minutes later the wolves just took off. The black coming from the East and the two grays from the West. The crowd was alive and people were yelling and cheering. Obvious sides were being taken. Passionate on both sides of the aile. The Black got to the north side first and came in fast. One gray stayed on the shore and the other joined the battle. 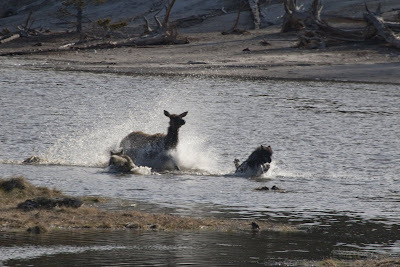 The elk defended well, bringing multiple charges with hoofs flying. Wolves have been killed by injuries sustained by hoofs and they seem to understand the possibility. 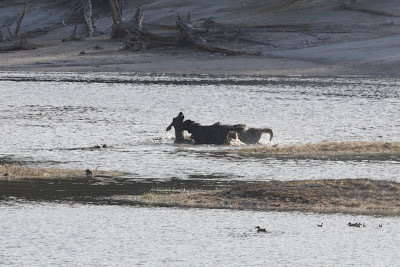 They continued the back and forth for about 10 minutes until the elk was driven into deep water. They steered her over to the gray waiting on the shore. 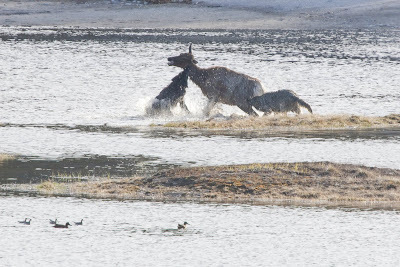 She was rested and jumped in managed to get up on top of the elk and forced her under the water. She was tiring but was able to get from under the fresh wolf and head back to her island. 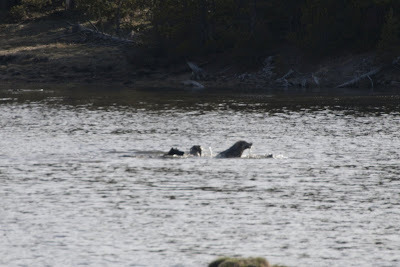 They calmly swam on either side until they got within 20 feet of the island. 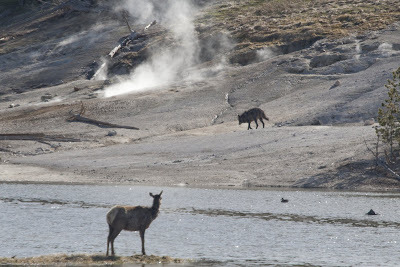 The elk turned on them and they went back and forth for another 10 minutes but she was moving slower and slower. Finally the black got her by the throat. She went down under the water but was able to get her head up a couple of more times for some last air and then it was over. One lady belted out "I HATE WOLVES" and my 6 year old son Adam responded with "Have a good lunch wolves!". Not the most sensitive. Some people were distraught, almost in shock. 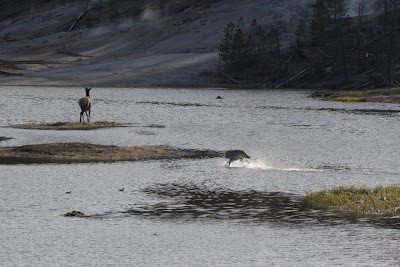 It appeared many times like the Elk was on the verge of victory but the wolves worked well as a team and just wore here down. While this happens often and people know it, the finality of the struggle was quite sobering to some. 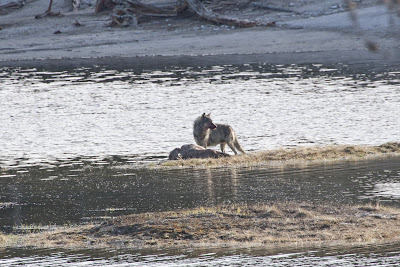 The wolves pulled the body up onto the Island and started to rip away at the tough skin. Then oddly the non-collared gray withdrew and waited while the other two ate. I'll have to do my research, but I assume one was the Alpha Male but I'm not sure on the other one (I believe the Alpha Female was with her cubs and doesn't hunt right now). 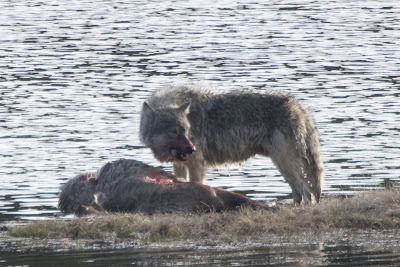 After those two had eaten they withdrew and the other wolf got to eat alone. They all returned eventually and ate until the sun went down below the trees. We retreated back to the hotel for some rest. What an exhilarating experience. We got to witness close up, a coordinated attack that was carried out to perfection. 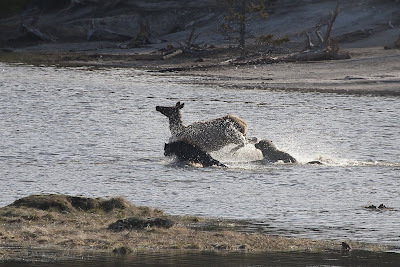 I was siding with the wolves for the sake of good pictures, but you had to be impressed with the valiant fight that the outnumbered elk cow put on. Wow Mel, that's quite the story and experience! Not something you see everyday, that's for sure.